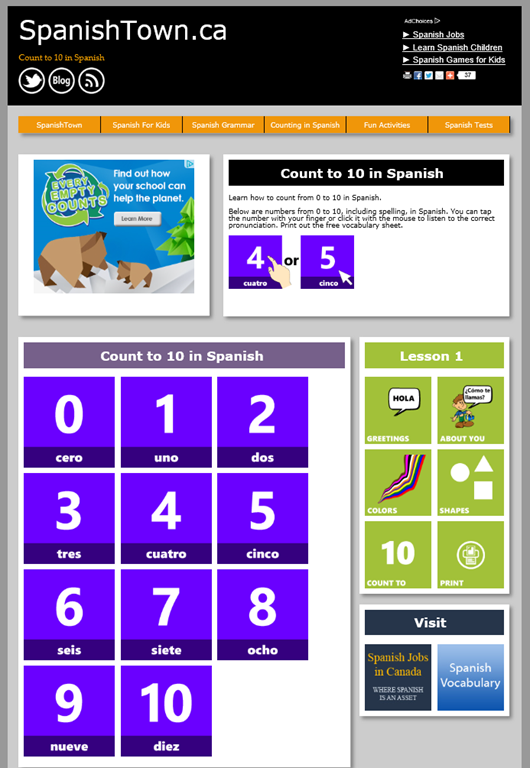 We have just put the finishing touches on our update to Lesson 1 Spanish for Kids. All five topic areas are now designed for modern browsers and work great with touch devices! We have added a little comic strip with Spanish audio to demonstrate a short conversion using our greeting’s vocabulary. Simply click or tap on one of the scenes to listen. Following the comic strip you will find a list of common Spanish vocabulary related to greetings. Again, it is designed for touch devices as well as the mouse. Learn Spanish vocabulary for greetings. In this section SpanishTown.ca introduces you to question and answer phrases commonly used when describing yourself or someone you know. The basic vocabulary focuses on asking someone’s name in Spanish, how old you are and where do you live. Another comic strip and additional Spanish phrases have been added. Try some out with a friend! Learn some Spanish phrases! These two short topic areas will provide you with some basic vocabulary for colors and shapes in Spanish. Click or tap on one of the tiles to listen in Spanish. Learn colors in Spanish! Learn Shapes in Spanish!